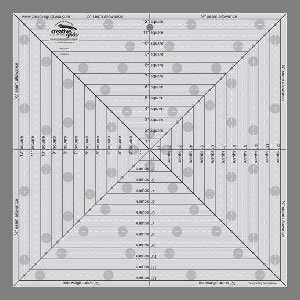 Use the horizontal, vertical, and diagonal markings to square up any block – up to a 12-1/2 inch square. The drilled holes at 1-1/2 to 11-1/2 inch increments, make it possible to square up, mark and add the seam allowance to any block. To fussy cut, center a fabric design in the 1 – 12 inch printed black solid squares. Mark the fabric through the drilled holes to add the seam allowance to your fussy cut piece - marked with a white dashed line on the ruler. Simply connect the dots and cut to size.